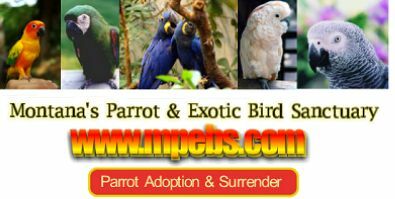 Welcome to The Ultimate Top 100 Parrot Sites! Share this Ultimate Top Site With a Friend! Parrot pictures with snappy captions. Wet, messy, chewing, or just generally adorable. Send us your pictures, and we'll write the captions so you don't have to worry about what to say. Check it out -- it's all free and just for fun. A site dedicated to bird food and nutrition. I post pictures of all my birdie meals and I also write reviews on different foods and stores. Unique pet products for pets on the move. My Bird Cage .com - The leading source fot HQ brand bird cages. The greatest parrot forum you can find, come on join and you'll see why i call it the greatest. Midori's world is the online world of a female green Pacific Parrotlet named Midori. A place for bird owners and bird lovers to share information and make new friends. The Lovebird Forum is the place for ALL lovebird fanatics to ask questions and share experiences about our beloved little parrots, see you there. Quality bird toys at affordable prices plus Customized pet greeting cards and magnets. Canadian breeder of many birds. Check web site for current birds available. Shipping in Canada only. We are a forum dedicated to those clownish, colorful birds called caiques! Founded March 23, 2006. While our focus is on caiques, all parrot species welcome! Come and chat with us! A fun, friendly & informative site where bird lovers can come & share information, stories, pictures etc of their feathered loved ones. Talk Budgies is a forum for budgie owners to talk about budgies. Includes an interactive forum, budgie journals, and gallery. Galaxy of Birds. A place where all bird lovers are welcome.